Baking Soda For Skin Care is a huge beauty secret. I’ve been using baking soda for skin care as a natural skin care exfoliate for 1 year now! Wow my skin has become more smooth, clear, and healthy. This baking soda for skin care review will change your mind about using baking soda on your skin if you’ve been hesitant or unaware of all the benefits of baking soda for skin care! Best of all, baking soda is inexpensive and actually works great for skin care. Using baking soda for my skin care gives me porcelain smooth skin EVERY TIME! My pores always feel unclogged like my skin can “breathe” and the baking soda always helps gently buff away any dry flaky skin I might have. It even helps remove scars over time! There’s a few awesome ways you can incorporate baking soda into your skin care routine and even make your current face cleansers work better by adding baking soda to them! WOW!!!! The baking soda for skin care routine listed below is the basic way to use baking soda on your skin. At the end of this post, I have 15 uses baking soda can be used for skin care. These are other advanced ways to use baking soda on your skin. Enjoy! The traditional baking soda is by Arm & Hammer. As long as it’s sodium bicarbonate the brand does not matter. I have here the Target brand, Market Pantry baking soda and the Arm & Hammer baking soda. You can always find a box of baking soda in my medicine cabinet for brushing my teeth, and using as a skin care cleanser. I even take the box in the shower with me! I use baking soda for my personal skin care routine everyday! Most importantly, I use baking soda as a natural skin care cleanser and gentle microdermabrasion treatment. Yay! Because Baking soda for skin care is Cheap, easy, and effective! Here I will show you step by step how simple I use baking soda as a cleanser and exfoliant for my face every morning and night. Baking Soda For Skin Care -Step 1: place about 2 Teaspoons of baking soda into your hand. Baking Soda For Skin Care -Step 2: With your hand cupped, splash a little water on top of the baking soda and make a thin paste of baking soda. I like to make a thick paste which allows the baking soda to stick onto my face easier. Baking Soda For Skin Care – Step 3: Spread the baking soda onto your face in small areas. Baking Soda For Skin Care – Step 4: In circular motions, gently scrub the baking soda on the surface of your skin. After one minute of through scrubbing, allow the baking soda to sit on your skin for another minute. I find that when I let the baking soda sit on my skin, the softer my skin feels. Baking Soda For Skin Care – Step 5: Rinse the baking soda off your face with warm water. Your face should now feel super smooth like porcelain! Try it! Your skin will feel soooo silky smooth after your rinse. * Because your skin will be super exfoliated, Do NOT put anything drying on your skin such as alcohol. It will sting your face. Instead, try some nice rosehip seed oil, coconut oil, or olive oil to get a deeply moisturized face. Instead of using water, use olive Oil. This will help remove the thickest foundations and eye makeup. Here’s how I use the baking soda and olive oil as a practical makeup remover and all the skin care benefits of Olive Oil here. The baking soda will boost the efficiency of any cleanser by adding oxygen and lightly buffing away dead skin cells. This help make sure your cleanser is touching the new skin cells and not just the old dead skin cells. If you use a night time skin serum or moisturizer before you go to bed, use the baking soda exfoliater before you apply your serums! Your skin will be perfectly prepped for serums and absorb deeper! A deeper absorption means better results with any skin serum. I would use this before I used my (Estée Lauder New Advanced Night Repair Review) serum. To save money, I’m now using Rosehip Oil For Skin Care at night instead of the expensive Estee Lauder. Baking Soda For Skin Care – Baking soda will deodorize, soften, and help ease sore feet. Add a generous half cup to a basin of warm water for twenty minutes. Baking Soda For Skin Care – Yes, soaking in baking soda will soften your skin and help detoxify your whole body. Baking Soda For Skin Care – Wash your nails and scrub them with baking soda. Let the baking soda sit on your nails for about ten minutes until it dries and wash off. Use morning and night. #9 Baking Soda For Skin Care Sooth a Sunburn: Baking soda will cool down your burned skin. Just add a tablespoon to a wet wash cloth and set it on top of your sun burn. Baking Soda For Skin Care Use the basic baking soda and water in a 1 to 2 ratio. #11. Baking Soda For Skin Care Acne Spot Treatment: A little dab of a thick paste of baking soda mixed with Witch Hazel applied to your skin will kill bacteria and reduce swelling of the pimple. Baking Soda For Skin Care – If your scalp has “cradle cap” (a built up layer of dead skin and oil from not washing thoroughly) Use one part baking soda and one part water to cleanse and exfoliate the dead skin and oil off your scalp. 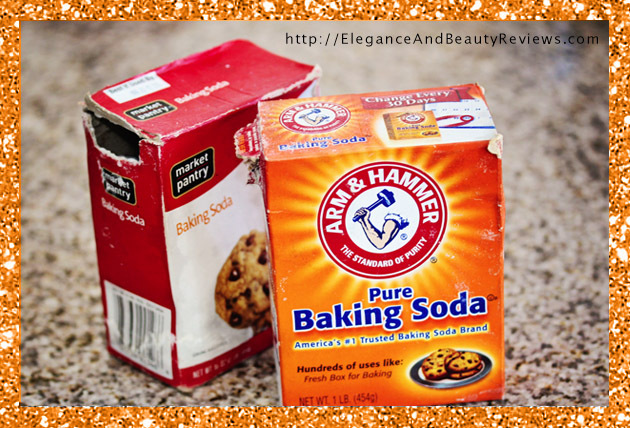 Baking Soda For Skin Care – I’ve had an itchy spray tan that I need to remove ASAP! I removed it with baking soda and olive oil. Baking Soda For Skin Care – This is great for underarms! If you’re out of your usual deodorant, sprinkle a little under your arm. Freshness guaranteed because it kills any bacteria that causes odor. Because baking soda is such a gently yet highly effective cleanser and exfoliator, I highly recommend using a moisturizer after. Thank You for reading my article: Baking Soda For Skin Care ! If you have any skin care tips for baking soda, PLEASE leave a comment below and share! PS: Did you learn anything new about Baking Soda For Skin Care ? Hi Faye, I use it morning and night. It works great! Good luck! Do you use it every morning & night? HI JEN! I LOVE ALL OF YOUR REVIEWS AND TIPS VERRRY HELPFUL! I JUST STARTED THE OIL CLEANSING METHOD AND I AM INLOVE =) I HAD A QUESTION ABOUT OIL CLEANGING W/ BAKING SODA IS IT SAFE TO DO THE TUMERIC/YOGURT MASK RIGHT AFTER I OIL CLEANSE OR WOULD THAT BE TO MUCH EXFOLIATION? ALSO WITH OIL CLEANSING WHAT DOES IT MEAN TO PURGE PORES OVER TIME? HOPE TO HEAR FROM YOU SOON, THANK YOU AGAIN FOR ALL YOUR HELP! Also how long does the purging process last with oil cleansing with extra virgin olive oil and baking soda? It takes anywhere from a month for skin to adjust to the oil. Honestly. I had a breakout but ever since my skin adjusted, I’ll never go back! Thanks for all the comments! I love talking about skin care. You can do the facial after the oil cleanse because it’s very gentle for you skin. However if you do use the baking soda for for a long time in one session you could “over exfoliate” maybe wait a couple days! Good luck! pls d baking soda, is it the one they use in bakin pasteries? and apart frm using ur rice cleanser, can i use any other cleanser? Yes you can, however I rarely use anything else. Please tell me if the wrinkles treatment in 20 mins is both for men and women? why does the baking soda after scrubbing burn a lot? Perhaps the baking soda removed too much dead skin. It’s hard to tell how long to use the baking soda for but it works great! 🙂 Yes, this treatment is for both men and women. is baking soda can be use for whitening skin? Yesm you can whiten skin with baking soda. If you use baking soda everyday, your skin will not tan. Also, using baking soda everyday will help remove any sun damage and reveal your lighter skin. I hope that helps answer your question. Hey Jen so using baking soda on your face on a daily will not allow you to tan permanently? what do I do if I want to tan during the summer but still use baking soda, please help! That’s correct! I don’t tan at all. However, you can always use baking soda and simply use a tan foundation to match. Hope that helps! This is actually common in the tanning community because women don’t want their face to age. Can I use baking soda on my neck? Yes you can use baking soda on your neck. I like to apply it on my face and neck when I’m in the shower. Apply it with a little olive oil to help prevent or treat wrinkles on the neck too. 🙂 I love baking soda! I have no problem in my face. but i noticed lately that my skin turned to be dry, so i decided to use baking soda, and already i used it .it’s so amazing ^^ Thanks.. but my question is :Should i follow any else routine to keep my face perfect because i had never followed any routine for my skin ? Yes, you should use it every few days. I love using baking soda with a little olive oil, that will help your dry skin too. I have a major acne problem which left scars. Can I use the arm and hammer baking soda paste to get rid of that. And also can I use it everyday! Yes, you can use baking soda every day as long as you’re not too aggressive with it. use it gently. I know sometimes I start scrubbing my face with it and it burns a little when I rinse. It’s helped keep my pores unclogged, I have been struggling with acne since I was 13. I tried the baking soda skin care remedy and it works very well. My skin feels so healthy and exfoliated now. This is what I needed. Thank you. I have a very fair complexion. I’m rarely exposed to sun so I don’t have sun burns or tanned skin. But my face is still very much darker compared to my other body parts. It’s really dark around my lips and I also have dark circles around my eyes. So how do treat my dark toned face and reveal my natural skin tone? Yes, people of very fair skin often have some discoloration around the mouth and under the eyes. Because the skin is so pale, it can easily show what’s going on under neath the skin. Around the mouth pigmentation is usually hormonal and under the eyes can be a vitamin deficiency. I used to have dark under eye circles until I started using almond oil under my eyes every night and including spinach in my diet (my sandwiches) every day. You can use baking soda to lightly exfoliate, but I sounds like you may want to start increasing your consumption of vitamin K.
hi,i wanna try baking soda,but should i use this every morning and night or every night only? It’s best to use before bed. It will open your pores and clean away the day. I recommend daily exfoliating with baking soda and water. Also, microdermabrasion, and rice water skin care combined. So how long should u use it in order to see the preferred results? Does it take weeks or months? You will instantly feel smoother skin! To start seeing a more even skin tone it can take two months. Hi,this morning i tried to scrub my face with baking soda,when i start to lay on m’y face burn à lot nd son réd m’y face then i taked off from face the reason of why burn ? I want to know i i can use baking powder in place of baking soda.Tnks. Sorry but it’s not the same, use baking soda. Thank you for all the skin care recipes you share! I actually just made the vitamin c serum last night and I love it! I recently got the idea to use baking soda on my skin cause I have dark spots, I have wrinkles too, I am only 40, but my skin is very dry and I have many surface wrinkles when I smile on my cheeks. When I used baking soda, I felt like it dried my skin and made me have roughness, and the wrinkles got very bad, I thought it was the baking soda, but I’m researching and reading all these good results, so maybe I’m wrong and should use baking soda more. I just so sad about how fast these wrinkles came on and how bad they are, and not sure what to do. I’m hoping it’s just dry skin instead of age, so that it will go away after my skin isn’t dry. Any advice from anyone? You need to moisturize after using the baking soda my dear. Yes it sounds like you did a good job exfoliating. It will remove some skin and oils along with it, so please re moisten the skin. Good luck. Yes, reship oil is perfect for oily skin. I’m 24 years old girl. I am suffering from pimples problems. since, I was teenager main problem is I have wrinkles in my under eyes now. what I will do? I’m hopeless, plz help me! Try massaging olive oil under your eye area every morning and night before bed. Also, before applying under eye concealer, dab a little under your eye.